A super short film to accompany the earlier documentary of the same name. A photoplay of various caryatids to be found in Paris. 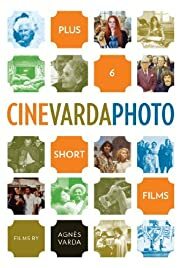 From legendary French New Wave director Agnes Varda comes the wonderful CINEVARDAPHOTO, a triptych of short films exploring the power and vitality of the photograph. In ���Ulysses�۝ (1982), she reunites with the subjects of a mysterious photo taken long ago. In the breathtaking, ���Salut les Cubains�۝ (1963), Varda sequences a series of pictures shot during a trip to Castro�۪s Cuba, including a thrilling Chris Marker-esque moment when a singer�۪s performance suddenly comes to life before our eyes. With Cinévardaphoto you get 3 great films in one package. Ms. Varda has brought together 3 films she has made over the span of her career. All of them deal with photos and as a whole present a meditation on what photography and the artistic impulse mean to her. While I think "Ydessa, the Bears, and etc...", and "Ulysse" are more intellectually stimulating, "Salut les Cubains" also offers an interesting time capsule appeal in seeing the Cuban revolution as some saw it back in the early sixties. It also offers up some amazing editing with the help of Chris Marker that shows the life "still photography" can exhibit. While each of the films could individually stand alone, the collection offers the viewer an opportunity to follow one woman's quest to examine art, photography in particular and her relationship to the artistic process in a most engaging manner. There is also an interesting temporal aspect to the organization of the trio of films. They are presented as films backwards chronologically speaking when considering when each film was made, but the subjects (the photos) of the films in question are shown in their chronology, oldest to the more recent. The newest film (digital video) is "Ydessa, the Bears, and etc...", and is about an artist/curator her peculiar obsession and an exhibit she did in Berlin. Ydessa collects pictures of people with teddy bears from the turn-of-the-last century through World War II. "Ulysse" is an examination from 1982 of a photo Ms. Varda took in the 1950's. "Salut les Cubains", the oldest of the three films from 1963 looks at the revolution via a photo exhibit some 10 years on. It might not seem that 3 documentaries about photos would be entertaining, but thanks to the genius of Agnes Varda you will be entertained and invited to think at the same time.